Irene B. Gravlin, 95, died peacefully on November 29, 2018. She was born March 27, 1923 in Tupper Lake to the late Edith (Dominie) and Harvey Tebo, Sr.
She attended Tupper Lake schools, and in 1942 married Kenneth F. Gravlin Sr. of Athol, MA. and Conifer. They raised three children: Sandra, Kenny, and Leta. When she retired, she enjoyed traveling abroad with her daughter, but always returned home to Tupper Lake. Irene enjoyed volunteering at Mercy Healthcare Nursing home and delivering Meals on Wheels, but what she truly enjoyed was being able to drive her family and friends to doctor’s appointments, the grocery store, and running errands. In her later years, she enjoyed spending time with her good friends Joyce Vollmer and Izzy Cassell. 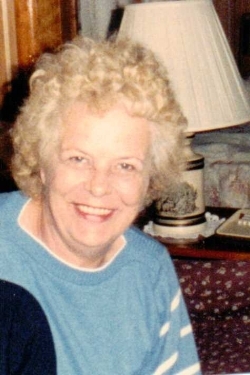 She is survived by her son Kenny (Rachel) and daughter Leta; four grandchildren: Bill, Scott, Cecilia, and Monique; eight great-grandchildren: Christopher, Katelin, Logan, Patrick, Ben, Alexa, Gauge and Garrett; and the ultimate loves of her life, her great-great grandchildren: Franklin and Fiona. Those who knew her best, knew that her family was her greatest joy. Many learned about her “kids” through the photos she carried and cherished. She was predeceased by her daughter Sandra, sisters Mercile Forkey and Kate Bump, and brothers Harvey (Maryann) and Will (Elaine) Tebo.